We describe a set of protocols that together provide a tissue-mimicking hydrogel bioink with which functional and viable 3-D tissue constructs can be bioprinted for use in in vitro screening applications. Skardal, A., Devarasetty, M., Kang, H. W., Seol, Y. J., Forsythe, S. D., Bishop, C., Shupe, T., Soker, S., Atala, A. Bioprinting Cellularized Constructs Using a Tissue-specific Hydrogel Bioink. J. Vis. Exp. (110), e53606, doi:10.3791/53606 (2016). Bioprinting has emerged as a versatile biofabrication approach for creating tissue engineered organ constructs. These constructs have potential use as organ replacements for implantation in patients, and also, when created on a smaller size scale as model "organoids" that can be used in in vitro systems for drug and toxicology screening. Despite development of a wide variety of bioprinting devices, application of bioprinting technology can be limited by the availability of materials that both expedite bioprinting procedures and support cell viability and function by providing tissue-specific cues. Here we describe a versatile hyaluronic acid (HA) and gelatin-based hydrogel system comprised of a multi-crosslinker, 2-stage crosslinking protocol, which can provide tissue specific biochemical signals and mimic the mechanical properties of in vivo tissues. Biochemical factors are provided by incorporating tissue-derived extracellular matrix materials, which include potent growth factors. Tissue mechanical properties are controlled combinations of PEG-based crosslinkers with varying molecular weights, geometries (linear or multi-arm), and functional groups to yield extrudable bioinks and final construct shear stiffness values over a wide range (100 Pa to 20 kPa). 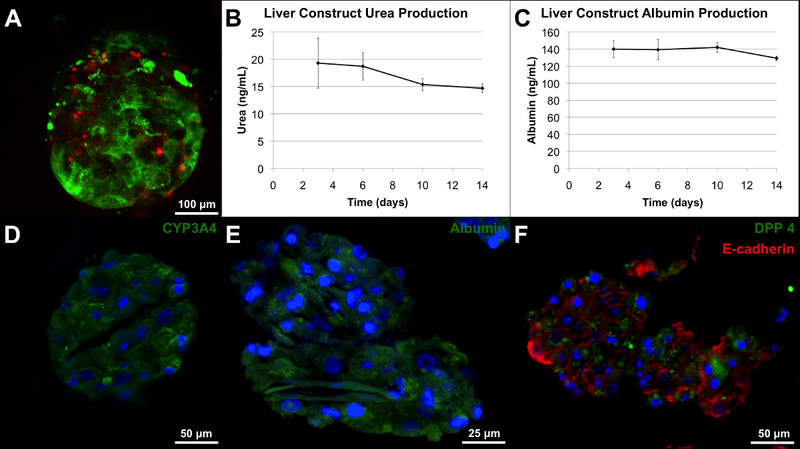 Using these parameters, hydrogel bioinks were used to bioprint primary liver spheroids in a liver-specific bioink to create in vitro liver constructs with high cell viability and measurable functional albumin and urea output. This methodology provides a general framework that can be adapted for future customization of hydrogels for biofabrication of a wide range of tissue construct types. In recent years, a variety of technologies have become available that addresses the need for alternative sources of functional organs and tissues by seeking to manufacture, or biofabricate, them. Bioprinting has emerged as one of the most promising of these technologies. Bioprinting can be thought of as a form of robotic additive fabrication of biological parts, that can be used to build or pattern viable organ-like or tissue-like structures in 3 dimensions.1 In most cases, bioprinting employs a 3-dimensional (3-D) printing device that is directed by a computer to deposit cells and biomaterials into precise positions, thereby recapitulating anatomically-mimicking physiological architectures.2 These devices print a "bioink", which can take the form of cell aggregates, cells encapsulated in hydrogels or viscous fluids, or cell-seeded microcarriers, as well as cell-free polymers that provide mechanical structure or act as cell-free placeholders.3,4 Following the bioprinting process, the resulting structure can be matured into functional tissue or organ structures, and used for its intended end application.5,6 To date, a complete fully functional human-sized organ has not been printed, but it remains the primary long-term goal of bioprinting research and development.2 However, small-scale "organoid" tissue constructs are currently being implemented in a number of applications, including pathology modeling, drug development, and toxicology screening. One of the main hurdles that researchers have encountered in applying bioprinting technology is that very few materials have been developed for the explicit purpose of bioprinting. To effectively succeed in bioprinting, a biomaterial must meet 4 basic requirements. The biomaterial needs to have 1) the appropriate mechanical properties to allow deposition (be it extrusion through a nozzle as a gel or an inkjet as a droplet), 2) the ability to hold its shape as a component of a 3-D structure after deposition, 3) the capability for user control of the 2 prior characteristics, and 4) a cell friendly and supportive environment at all phases of the bioprinting procedure.7 Historically, bioprinting work has often tried to employ existing traditional biomaterials in bioprinting devices without consideration for their compatibility, instead of designing a biomaterial to have the properties necessary for bioprinting and subsequent post-printing applications. These examples demonstrate the feasibility of generating materials that can by bioprinted effectively. However, in addition to integration with hardware, to successfully generate viable and functional 3-D tissue constructs, biomaterials must contain biochemical and mechanical cues that aid in maintaining cellular viability and function. These additional factors, biochemical and mechanical profiles, can have a significant influence on the successful function of bioprinted tissue constructs. Here we describe a protocol that represents a versatile approach used in our laboratory to formulate a hydrogel system that can be extrusion bioprinted, and customized to 1) contain the biochemical profile of a particular tissue type and 2) mimic the elastic modulus of that tissue type. By addressing these requirements, we aim to provide a material that can recapitulate the physiochemical and biological characteristics of in vivo tissue.31 The modular hydrogel composite system described herein takes advantage of a multi-crosslinking approach to yield extrudable bioinks, and allows a secondary crosslinking to stabilize and increases the stiffness of the end products to match a range of tissue types. Biochemical customization is met by using tissue-specific ECM components. As a demonstration, we employ a liver-specific variety of this hydrogel system to bioprint functional liver organoid constructs. The protocol described uses a custom 3-D bioprinting device. In general, this protocol can be adapted to most extrusion-based printers, specific printing parameters vary dramatically for each type of device and require testing by the user. Note: In general, this ECM digest will comprise 40% of the final hydrogel bioink volume that is employed. Several hundred milliliters of ECM digest solution can be prepared, aliquoted, and frozen at -80 °C for future use. Prior to hydrogel formulation, dissolve a photoinitiator, 2-hydroxy-4′-(2-hydroxyethoxy)-2-methylpropiophenone, in water at 0.1% w/v. Note: Volumes in the 50-100 ml range can be prepared ahead of time and stored shielded from light at 4 °C for several months. To form hydrogel bioinks, first dissolve the base material components from the hyaluronic acid (HA) hydrogel kits in the water-photoinitiator solution. Dissolve the thiolated HA and thiolated gelatin separately in water-photoinitiator solution (step 1.2) to make 2% w/v solutions. Dissolve polyethylene glycol diacrylate (PEGDA), the crosslinker in the hydrogel kits, in water-photoinitiator solution (step 1.2) to make an 8% w/v solution. Dissolve polyethylene glycol (PEG) 8-Arm alkyne (10 kDa MW) in water-photoinitiator solution (step 1.2) to make an 8% w/v solution. In general, form hydrogels using the following scheme, although additional customization is possible. Combine 4 parts 2% thiolated HA, 4 parts 2% thiolated gelatin, 1 part crosslinker 1, 1 part crosslinker 2 with 8 parts tissue ECM solution and 2 parts hepatocyte culture media (HCM) (or 10 parts water as a generic non-tissue-specific hydrogel). Note: Additional unmodified HA or gelatin can be added to make the bioink extrude more smoothly. This is described below. Vortex the resulting mixture on high (speed 10 out of 10) for 10 sec to mix prior to use. For extrusion or bioprinting testing, transfer the mixture into a syringe or printer cartridge and allow it to crosslink spontaneously for 30 min (stage 1 crosslinking) at 37 °C. For rheological measurements, transfer the mixture into a 35 mm Petri dish and allow it to crosslink for 30 min. Note: The mixture immediately begins to crosslink through thiol-acrylate bond formation and will begin to increase in viscosity. The mixture should be transferred to a syringe, print cartridge, or target location within 10 min to avoid clogging of a pipette or syringe during transfer. When secondary crosslinking (stage 2) is desired, irradiate the stage 1-crosslinked gels with ultraviolet light (365 nm, 18 W/cm2) to initiate a thiol-alkyne polymerization reaction. Note: Duration of irradiation is dependent on the surface area of the material. In general, a square centimeter of material only requires 1-2 sec of UV exposure at this UV power. Prior to integration testing with bioprinting devices, test extrusion characteristics on the laboratory bench with simple extrusion tests using standard syringes and small gauge needle tips (20-30 gauge). Push the bioink through a standard syringe to achieve smoothly extruded filaments of hydrogel with few or no bumps. Extruding of lines or simple patterns is sufficient to determine success. For bioprinter integration, load bioink preparations by pipetting them into printer cartridges, and allow 30 min for the bioink to undergo spontaneous stage 1 crosslinking within the cartridge. Note: Volume of bioink depends on the specific application and should be determined by the user. Printer cartridges may resemble or be syringes that are compatible with the bioprinter device. Evaluate extrusion compatibility for bioprinting by printing a simple pattern using the bioink. For example, print a 7 x 7 mm pattern comprised of parallel lines. Apply pressure (e.g., 20 kPa pneumatic pressure) while the printhead moves in the X-Y plane at a velocity of approximately 300 mm/min. Note: Printhead nozzle diameters of various sizes can be used, but conical nozzles with 400-500 µM diameter openings are optimal for printing spheroids in the 250-350 µm range. If the extruded materials are lumpy or irregular, see step 2.4, or reduce the amount of PEGDA to soften the stage 1 crosslinked material. Properly prepared bioink formulations extrude smoothly, allowing precise deposition in desired patterns or architectures. Note: The bioprinting procedures described use a custom 3-D bioprinting device designed in house specifically for tissue construct printing.32 As such, specific printing parameters vary dramatically for each type of device and require testing by the user. To improve extrusion properties, supplement unmodified HA and gelatin to the bioinks (1.5 mg/ml and 30 mg/ml, respectively). Note: Bioprinting can be performed without spheroids, but instead with individual cells suspended in the hydrogel bioinks as well. Spheroids are employed here to accelerate cell-cell interactions and construct functionality. The number of spheroids or cells employed depends on the specific application and should be determined by the user. These steps should be performed under sterile conditions, using sterile supplies. Prepare HCM by adding the thawed contents of the HCM supplement component kit to the hepatocyte basal media (HBM) and sterile filtering. Thaw the supplement components until liquid. Add the supplement components (ascorbic acid, 0.5 ml; bovine serum albumin [fatty acid free], 10 ml; gentamicin sulfate/amphotericin B, 0.5 ml; hydrocortisone 21-hemisuccinate, 0.5 ml; insulin, 0.5 ml; human recombinant epidermal growth factor, 0.5 ml; transferring, 0.5 ml) to the 500 ml HBM. Sterile filter through a 0.45 μm or 0.22 μm filter using a bottle-top filter unit or a syringe tip filter. Determine the cell density of primary human hepatocytes, Kupffer cells, and stellate cells by counting on a hemocytometer after each cell type has been thawed according to manufacturers' instructions. Combine primary human hepatocytes, Kupffer cells, and stellate cells in an 80:10:10 ratio by cell number in HCM media that has been warmed to 37 °C in a conical tube. Note: The volume of media to be used depends on the overall cell number specific to the application and should be determined by the user. Centrifuge the cell suspension for 5 min at 520 x g at 20 °C. Aspirate the supernatant, leaving behind the cell pellet. Resuspend the cell pellet in HCM media to yield a cell suspension containing 1,000 cells per 40 µl media. Total volume is dependent on the number of spheroids being produced. Transfer the cell suspension to 96-well format hanging drop plates. Add a total of approximately 1,000 cells to each well in HCM and maintain at 37 °C, in 5% CO2 for 3 days during which multicellular spheroids form. Collect liver spheroids from the hanging drop plate using a pipettor. Transfer to a sterile 15 ml conical tube. Prepare a formulation of liver ECM-containing hydrogel bioink as described in Step 1, employing 8% PEGDA and 8% 8-Arm PEG alkyne as crosslinkers. Use this combination for its capability in resulting in a hydrogel close in shear elastic modulus to native liver tissue. Let the spheroids settle to the bottom of the conical tube in which they were placed in Step 3.1.7. This varies based on spheroid size and density, but generally occurs within 1-2 min. Remove all media by carefully aspirating or with a pipettor. Transfer the desired volume of freshly prepared hydrogel bioink solution to the conical tube containing the spheroids. Generally, an appropriate volume is 10%-25% greater than the volume of the 3-D construct to be printed. Carefully pipette up and down to resuspend the spheroids in the hydrogel bioink solution. Transfer to a bioprinter cartridge using a pipettor or serological pipette. Inside the bioprinter cartridge, allow the solution to undergo the first crosslinking stage (thiol-acrylate reaction) for 30 min. Note: Depending on spheroid size, the cartridge may need to be slowly rotated or the contents may need to be mixed with a sterile spatula to keep the spheroids distributed throughout the bioink during the stage 1 crosslinking. This is less of a necessity for bioinks prepared with suspended cells instead of spheroids. Note: Following stage 1 crosslinking, users have an operating window of several hours. However, it is recommended to perform the bioprinting process quickly to improve cell viability. Following stage 1 crosslinking, use a bioprinting device to create desired hydrogel structures containing the primary liver spheroids (or other cells). Note: This technology provides a system for biofabricating a wide variety of structures. Parameters such as total volume, number of cells or spheroids, the printed structure geometry, and substrate on which constructs are printed are highly dependent on the goals of the user. After deposition into the desired configuration, administer UV light for 2-4 sec to initiate the secondary crosslinking mechanism, stabilizing the constructs and increasing stiffness to the desired level. Note: The concentration of PEG-alkyne, and thus the overall final crosslinking density, primarily controls the final construct stiffness. Repeat the steps 3.2.4 and 3.2.5 in order to create multi-layered constructs. When the procedures described above are followed correctly, hydrogels should contain a biochemical profile specific to the target tissue type,20 allow for a high degree of control over bioprinting and final elastic modulus,34 and support viable functional cells in tissue constructs. To best mimic native liver, the hydrogel bioink was supplemented by liver ECM solutions and a Growth Factor Array,20 ECM solutions contain a wide variety of growth factors and cytokines (shown in pg/ml, Figure 1A). These include brain-derived neurotrophic factor (BDNF), bFGF, bone morphogenetic protein 5 (BMP-5), FGF-4, insulin-like growth factor binding protein 2 (IGFBP-2), TGF- b1, BMP-7, EGF, FGF-7, growth hormone (GH), heparin-binding EGF-like growth factor (HB-EGF), HGF and neurotrophin 3 (NT-3). Additionally, ECM solutions contain additional structural components, which are analyzed by colorimetric assays.20 For liver ECM solutions, total collagen content of liver ECM solutions was 91.33 ± 0.58 mg/ml, the elastin content was 189.33 ± 48.40 mg/ml, and the glycosaminoglycan (GAG) content was 86.00 ± 53.45 mg/ml (Figure 1B). Chemical strategy and implementation of stage 1 and stage 2 crosslinking of the hydrogel bioinks is described in Figure 2. In general, crosslinkers such as Extralink, which are based on acrylated PEG polymers, spontaneously react with thiol groups on the HA and gelatin chains at neutral pH (stage 1) in presence of cells to form a soft extrudable hydrogel. This soft hydrogel can be bioprinted as a bioink, after which UV light is used to initiate photopolymerization of unreacted thiols and the secondary crosslinkers based on alkyne-modified PEG polymers. The particular molecular weights and geometries of the crosslinkers govern the end stiffness of the bioprinted construct. A 7 x 7 mm pattern was implemented for testing purposes (Figure 3A). Initial tests showed that the initial formulations were extrudable, but appeared irregular and clumped during and after extrusion (Figure 3B). To improve extrusion properties, unmodified HA and gelatin was supplemented to the bioinks (1.5 mg/ml and 30 mg/ml). The improved smooth printed structure is shown in Figure 3C. Using the 3-D bioprinter the bioactive liver-specific hydrogel bioink was used to encapsulate and deposit primary human liver spheroids, previously prepared by hanging drop cultures, onto plastic coverslips. Being printed on plastic coverslips allowed for robust handling and transfer to a variety of cell culture environments. After bioprinting, high cell viability in the liver constructs was observed after LIVE/DEAD viability/cytotoxicity staining and confocal microscopy (Figure 4A). Under optimal environmental conditions viability should be above 85%. Primary human hepatocytes are generally considered sensitive to mechanical and chemical stresses, which required some optimization of environmental variables. Following bioprinting and verification of viability, additional liver constructs that are placed in culture can be assessed for functionality by analyzing media aliquots removed on day 3, day 7, day 10, and day 14 for analysis of secreted urea and albumin. The urea colorimetric assays reveal a relatively consistent level of urea secretion from the liver constructs over the 14-day time course, remaining between 15 and 20 ng/ml (Figure 4B). Detected urea levels were not significantly different from one another at the different time points. The Human Albumin ELISA assay reveals that albumin production from the constructs also remains relatively consistent over time, remaining stable between 125 and 140 ng/ml (Figure 4C). Additionally, when stained for markers indicative of liver tissue, positive expression of intracellular albumin, CYP3A4 (a cytochrome p450 isoform involved on metabolism), E-cadherin (an epithelial cell-cell adhesion protein), and dipeptidyl peptidase-4 (a protein expressed highly in liver) are observed (Figure 4D-F). Taken together, this viability and functional data suggest that the tissue-specific hydrogel bioink aids in maintaining viability and function of bioprinted primary cell-based liver constructs. Figure 1. Hydrogel component characterization and stiffness assessment. A) Growth factor and cytokine analysis by proteomics arrays for ECM solutions prepared from liver. B) Colorimetric assay quantification of collagen, glycosaminoglycan, and elastin content in liver ECM solutions. C) Demonstration of the capability to control bioink stiffness. After stage 1 crosslinking, the gel is relatively soft and able to be extruded smoothly. After stage 2 crosslinking by UV light, elastic modulus increases by more than an order of magnitude, mimicking liver tissue elastic modulus. Error bars indicate standard deviation. Please click here to view a larger version of this figure. Figure 2. Employing multiple PEG-based crosslinkers for extrusion bioprinting and control over tissue construct mechanical properties. 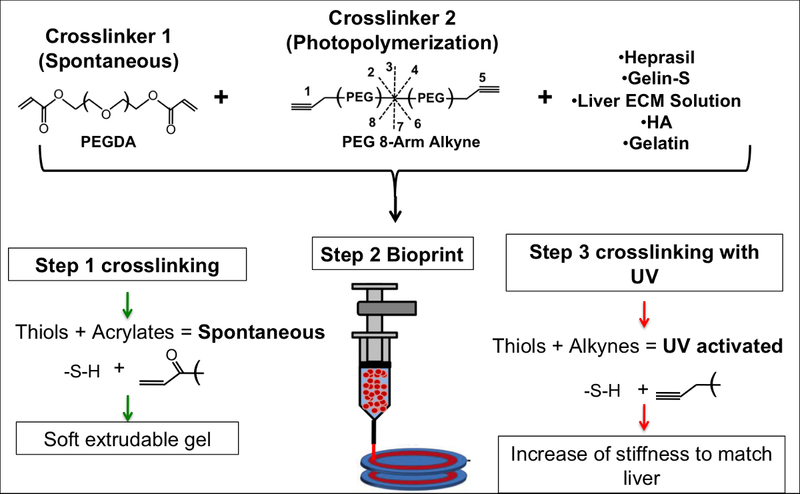 Strategy of formulation of printable bioinks comprised of acrylate-based crosslinkers (crosslinker 1), alkyne-based crosslinkers (crosslinker 2), thiolated HA, thiolated gelatin, tissue ECM materials, and unmodified HA and gelatin. The bioink formulation is prepared and spontaneously crosslinks through thiol-acrylate binding, resulting in a soft, extrudable material. Bioprinting is performed. Lastly, the bioprinted layers are fused, stabilized, and brought to the liver elastic modulus. This process can be repeated to generate multi-layered structures. Please click here to view a larger version of this figure. Figure 3. Bioprinting testing of bioinks. A) A 7 x 7 mm winding pattern was used for bioink extrusion testing in the bioprinter. B) The initial formulation of a PEGDA and 8-arm PEG alkyne bioink resulted in irregular deposition. C) Adding raw HA and gelatin improved extrusion, resulting in smooth extrusion of the bioink. Scale bar - 1 mm. Please click here to view a larger version of this figure. Figure 4. Demonstration of viability and function of liver spheroids bioprinted in the liver-specific hydrogel bioink. A) Implementation of the liver bioink for bioprinting, resulted in high viability constructs. Green - calcein AM-stained viable cells; Red - Ethidium homodimer-stained dead cells. B) Urea and C) albumin secreted by liver constructs over 14 days in culture, quantified by colorimetric and ELISA assays, respectively. Error bars indicate standard deviation. Immunostaining of markers associated with liver tissue: D) CYP3A4, E) Intracellular albumin, and F) DPP4 and E-cadherin. Green or red - indicated stain; Blue - DAPI. Please click here to view a larger version of this figure. The critical characteristic of this system that makes it useful is the ability to support multiple chemical reactions that can be harnessed to manipulate the polymerization kinetics and mechanical properties of the bioink system. By employing 2 independent reaction types, thiol-acrylate and thiol-alkyne, we achieve the capability to perform a stage 1 thiol-acrylate reaction that results in a soft material that can be extruded through a syringe or bioprinting device, and a stage 2 thiol-alkyne reaction, which is only initiated upon UV exposure in the presence of a photoinitiator, which determines the elastic modulus of the final bioprinted construct. These multiple steps result in a bioprintable material. As such, in order to achieve a stable bioink that supports extrusion and subsequent elastic modulus customization, maintaining these separate reaction types is important. The primary draw to using the system for biofabrication is its ease for customization, which is done through either manipulating the end elastic modulus through the secondary crosslinker, or through inclusion of different tissue-derived ECM materials or growth factor cocktails. The ECM in tissues contains a variety of growth factors and other cytokines, which often vary in overall distribution between tissue types. We believe that these factors are integral for maintaining function of certain cell types, such as primary human hepatocytes. Implementation of this concept was previously demonstrated to increase viability and function of primary human hepatocytes in heparinized hyaluronic acid sandwich cultures.20 By combining heparin chains in the hydrogel with heparin-binding growth factors as well as other ECM components from liver ECM, we were able to present this liver-specific biochemical profile to primary human hepatocytes, maintaining viability and function in vitro for an extended period of time. This approach can easily be extended to other tissue types, allowing researchers to achieve recapitulation of these tissue-specific factors by decellularizing and solubilizing other tissues. Users should be aware that while the base components of this bioink system have been implemented in bioprinting previously,10,12,17 but in less nuanced, tissue specific approaches, as well as a variety of other regenerative medicine applications,35-45 biofabrication has not been attempted for all tissue types. As such, there may be some further development and troubleshooting required in order to create such additional tissue constructs. However, a modular system such as that described here may very well be adaptable. Other potential limitations include natural affinities that some cell types may have toward specific biomaterials. In general, we have found that the hyaluronic acid, gelatin, and PEG-based base components of this hydrogel system support viable cultures of a wide variety of cell types, yet there may be some types of cells that perform better in engineered environments of different compositions, such as collagen, which has an inherent fibrous nature, or elastin, which is by nature more elastic. As such, consideration for the optimal material for a given tissue type and end application is important, and the hydrogel bioink system described here may not be adequate for all uses. Additionally, it is important to consider the environmental conditions under which bioprinting is performed. During the development of this protocol, we transitioned from near ambient (room temperature) conditions using bioinks without any cell media, which lead to poor viability if the preparation and printing time was too drawn out, to more rapid protocols under 37 °C using bioinks with a media component, which dramatically increased cell viability. Until recently, few materials or material systems were developed specifically to interface with bioprinting systems. As a result, most materials are simplistic, leveraging either their biological characteristics to support cells, or, their compatibility with biofabrication hardware. Few materials are optimal in both realms. The system described in this methodology decouples these characteristics, thereby allowing customization of biological characterization, while facilitating the mechanical properties necessary for extrusion bioprinting. An additional distinction of this hydrogel bioink system is that it can mimic both biochemical and physical parameters of the target tissues it is used for biofabricating. This supports an impressive level of flexibility, allowing recapitulation of the biochemical factors of nearly any tissue, as well as matching the elastic modulus of any soft tissue. The attention to both these aspects of a tissue have rarely been explored in tandem. The modular nature of this technology affords a flexibility to be implemented in a wide variety of applications. The ability to mimic various tissue types provides the capability to biofabricate not just liver constructs used as an example in this work, but constructs representing many of the other tissues in the body. Perhaps the most obvious broad application using these parameters is the ability to match both aspects to a particular tissue to optimize the end function of engineered constructs for real applications such as implantation or drug and toxicology screening. While generation of human-sized tissues for implantation in patients is the end goal for many researchers, due to regulatory hurdles, cell sourcing, and limitations on the ability to fabricate functional vasculature into tissue engineered organs, this lofty goal will require further development and time to be realized. However, technologies such as the methodology described here are currently beginning to be implemented for generating "organoids" for in vitro platforms. Our team, as well as others, is currently utilizing organoid biofabrication to create model systems in which toxicology studies are performed. Additionally, such organoids can be employed to study pathologies and disease progression, such as cancer,46 and test potential therapeutic treatments. Lastly, this system also supports another important use. By manipulating these parameters independently, researchers can perform basic science experiments to determine the relative importance of biochemical versus mechanical factors. The authors gratefully acknowledge funding by the Defense Threat Reduction Agency (DTRA) under Space and Naval Warfare Systems Center Pacific (SSC PACIFIC) Contract No. N6601-13-C-2027. The publication of this material does not constitute approval by the government of the findings or conclusions herein. Triton X-100 Sigma T9284 Other manufacturers are ok. Ammonium hydroxide Fischer Scientific A669 Other manufacturers are ok.
Bioprinter n/a n/a The bioprinter described herein was custom built in-house. In general, other devices are adequate provided they support computer controlled extrusion-based printing of hydrogel materials. Visconti, R. P., et al. Towards organ printing: engineering an intra-organ branched vascular tree. Expert Opin Biol Ther. 10, 409-420 (2010). Derby, B. Printing and prototyping of tissues and scaffolds. Science. 338, 921-926 (2012). Fedorovich, N. E., et al. Hydrogels as extracellular matrices for skeletal tissue engineering: state-of-the-art and novel application in organ printing. Tissue Eng. 13, 1905-1925 (2007). Mironov, V., Boland, T., Trusk, T., Forgacs, G., Markwald, R. R. Organ printing: computer-aided jet-based 3D tissue engineering. Trends Biotechnol. 21, 157-161 (2003). Boland, T., Mironov, V., Gutowska, A., Roth, E. A., Markwald, R. R. Cell and organ printing 2: fusion of cell aggregates in three-dimensional gels. Anat Rec A Discov Mol Cell Evol Biol. 272, 497-502 (2003). Mironov, V., Kasyanov, V., Drake, C., Markwald, R. R. Organ printing: promises and challenges. Regen Med. 3, 93-103 (2008). Skardal, A., Atala, A. Biomaterials for integration with 3-d bioprinting. Ann Biomed Eng. 43, 730-746 (2015). Norotte, C., Marga, F. S., Niklason, L. E., Forgacs, G. Scaffold-free vascular tissue engineering using bioprinting. Biomaterials. 30, 5910-5917 (2009). Skardal, A., Zhang, J., Prestwich, G. D. Bioprinting vessel-like constructs using hyaluronan hydrogels crosslinked with tetrahedral polyethylene glycol tetracrylates. Biomaterials. 31, 6173-6181 (2010). Bertassoni, L. E., et al. Direct-write bioprinting of cell-laden methacrylated gelatin hydrogels. Biofabrication. 6, 024105 (2014). Skardal, A., Zhang, J., McCoard, L., Oottamasathien, S., Prestwich, G. D. Dynamically crosslinked gold nanoparticle - hyaluronan hydrogels. Adv Mater. 22, 4736-4740 (2010). Skardal, A., et al. Photocrosslinkable hyaluronan-gelatin hydrogels for two-step bioprinting. Tissue Eng Part A. 16, 2675-2685 (2010). Skardal, A., et al. Bioprinted amniotic fluid-derived stem cells accelerate healing of large skin wounds. Stem Cells Transl Med. 1, 792-802 (2012). Xu, T., et al. Hybrid printing of mechanically and biologically improved constructs for cartilage tissue engineering applications. Biofabrication. 5, 015001 (2013). Xu, T., et al. Complex heterogeneous tissue constructs containing multiple cell types prepared by inkjet printing technology. Biomaterials. 34, 130-139 (2013). Murphy, S. V., Skardal, A., Atala, A. Evaluation of hydrogels for bio-printing applications. J Biomed Mater Res A. 101, 272-284 (2013). Badylak, S. F. The extracellular matrix as a biologic scaffold material. Biomaterials. 28, 3587-3593 (2007). Freytes, D. O., Tullius, R. S., Valentin, J. E., Stewart-Akers, A. M., Badylak, S. F. Hydrated versus lyophilized forms of porcine extracellular matrix derived from the urinary bladder. J Biomed Mater Res A. 87, 862-872 (2008). Skardal, A., et al. Tissue specific synthetic ECM hydrogels for 3-D in vitro maintenance of hepatocyte function. Biomaterials. 33, 4565-4575 (2012). Johnson, T. D., Braden, R. L., Christman, K. L. Injectable ECM scaffolds for cardiac repair. Methods Mol Biol. 1181, 109-120 (2014). Pati, F., et al. Printing three-dimensional tissue analogues with decellularized extracellular matrix bioink. Nat comm. 5, 3935 (2014). Vanderhooft, J. L., Alcoutlabi, M., Magda, J. J., Prestwich, G. D. Rheological properties of cross-linked hyaluronan-gelatin hydrogels for tissue engineering. Macromol Biosci. 9, 20-28 (2009). Engler, A. J., et al. Embryonic cardiomyocytes beat best on a matrix with heart-like elasticity: scar-like rigidity inhibits beating. J Cell Sci. 121, 3794-3802 (2008). Chaudhuri, T., Rehfeldt, F., Sweeney, H. L., Discher, D. E. Preparation of collagen-coated gels that maximize in vitro myogenesis of stem cells by matching the lateral elasticity of in vivo muscle. Methods Mol Biol. 621, 185-202 (2010). Lozoya, O. A., et al. Regulation of hepatic stem/progenitor phenotype by microenvironment stiffness in hydrogel models of the human liver stem cell niche. Biomaterials. 32, 7389-7402 (2011). Holst, J., et al. Substrate elasticity provides mechanical signals for the expansion of hemopoietic stem and progenitor cells. Nat Biotechnol. 28, 1123-1128 (2010). Skardal, A., Mack, D., Atala, A., Soker, S. Substrate elasticity controls cell proliferation, surface marker expression and motile phenotype in amniotic fluid-derived stem cells. J Mech Behav Biomed Mater. 17, 307-316 (2013). Rutz, A. L., Hyland, K. E., Jakus, A. E., Burghardt, W. R., Shah, R. N. A multimaterial bioink method for 3D printing tunable, cell-compatible hydrogels. Adv Mater. 27, 1607-1614 (2015). Malda, J., et al. 25th anniversary article: Engineering hydrogels for biofabrication. Adv Mater. 25, 5011-5028 (2013). Integrated organ and tissue printing methods, system and apparatus. US Patent. Kang, H. W., Lee, S. J., Atala, A., Yoo, J. J. 2012/00889238 A1 (2011). Drewitz, M., et al. Towards automated production and drug sensitivity testing using scaffold-free spherical tumor microtissues. Biotechnol J. 6, 1488-1496 (2011). Skardal, A., et al. A hydrogel bioink toolkit for mimicking native tissue biochemical and mechanical properties in bioprinted tissue constructs. Acta Biomater. 25, 24-34 (2015). Peattie, R. A., et al. Stimulation of in vivo angiogenesis by cytokine-loaded hyaluronic acid hydrogel implants. Biomaterials. 25, 2789-2798 (2004). Flynn, L., Prestwich, G. D., Semple, J. L., Woodhouse, K. A. Adipose tissue engineering with naturally derived scaffolds and adipose-derived stem cells. Biomaterials. 28, 3834-3842 (2007). Flynn, L., Prestwich, G. D., Semple, J. L., Woodhouse, K. A. Adipose tissue engineering in vivo with adipose-derived stem cells on naturally derived scaffolds. J Biomed Mater Res A. 89, 929-941 (2009). Duflo, S., Thibeault, S. L., Li, W., Shu, X. Z., Prestwich, G. Effect of a synthetic extracellular matrix on vocal fold lamina propria gene expression in early wound healing. Tissue Eng. 12, 3201-3207 (2006). Duflo, S., Thibeault, S. L., Li, W., Shu, X. Z., Prestwich, G. D. Vocal fold tissue repair in vivo using a synthetic extracellular matrix. Tissue Eng. 12, 2171-2180 (2006). Liu, Y., Shu, X. Z., Prestwich, G. D. Osteochondral defect repair with autologous bone marrow-derived mesenchymal stem cells in an injectable, in situ, cross-linked synthetic extracellular matrix. Tissue Eng. 12, 3405-3416 (2006). Liu, Y., et al. Accelerated repair of cortical bone defects using a synthetic extracellular matrix to deliver human demineralized bone matrix. J Orthop Res. 24, 1454-1462 (2006). Zhang, J., Skardal, A., Prestwich, G. D. Engineered extracellular matrices with cleavable crosslinkers for cell expansion and easy cell recovery. Biomaterials. 29, 4521-4531 (2008). Serban, M. A., Scott, A., Prestwich, G. D. Unit 10.14, Use of hyaluronan-derived hydrogels for three-dimensional cell culture and tumor xenografts. Curr Protoc Cell Biol. Chapter 10, (2008). Xu, X., Prestwich, G. D. Inhibition of tumor growth and angiogenesis by a lysophosphatidic acid antagonist in an engineered three-dimensional lung cancer xenograft model. Cancer. 116, 1739-1750 (2010). Liu, Y., Shu, X. Z., Prestwich, G. D. Tumor engineering: orthotopic cancer models in mice using cell-loaded, injectable, cross-linked hyaluronan-derived hydrogels. Tissue Eng. 13, 1091-1101 (2007). Skardal, A., Devarasetty, M., Rodman, C., Atala, A., Soker, S. Liver-Tumor Hybrid Organoids for Modeling Tumor Growth and Drug Response In Vitro. Ann Biomed Eng. (2015).